All the while, the turbines are getting MUCH taller, in excess of 600 feet are proposed for a Great Lake area, and these companies want to SHORTEN our Ohio setbacks…all so they can grab more taxpayer $ handouts. This picture explains why greater setbacks are absolutely essential to protect people!! The wind gusts were ONLY 45 mph. If a blad shears, pieces will fly hundreds, if not thousands of feet away…. 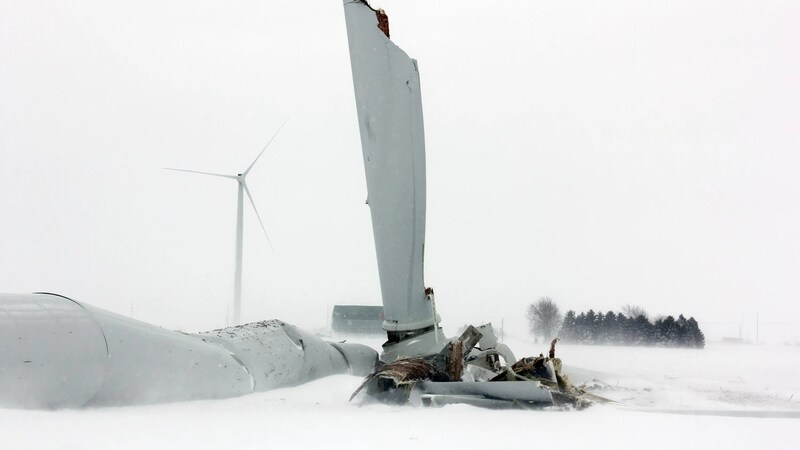 A nearly 400-foot wind turbine has partially collapsed in a field in the Thumb. The turbine, part of Exelon Wind Generation’s 32-turbine Harvest Wind Farm, fell about 5:20 a.m. Thursday, Oliver Township Supervisor Larry Krohn told the Huron Daily Tribune in Bad Axe. …The National Weather Service reported wind gusts up to 45 mph in the area.